These poorly positioned impacted teeth can cause many problems. When they are partially erupted, the opening around the teeth allows bacteria to grow and will eventually cause an infection. The result: swelling, stiffness, pain, and illness. The pressure from the erupting wisdom teeth may move other teeth and disrupt the orthodontic or natural alignment of teeth. The most serious problem occurs when tumors or cysts form around the impacted wisdom teeth, resulting in the destruction of the jawbone and healthy teeth. Removal of the offending impacted teeth usually resolves these problems. It has now been scientifically confirmed with multiple studies that periodontal disease (gum disease) most often starts around the wisdom teeth. Once this disease process starts it can easily spread to other areas in the mouth. Early removal is recommended to avoid such future problems and to decrease the surgical risk involved with the procedure. Call NJ Center for Oral Surgery Phone Number 973-226-8444 with questions or to schedule your Wisdom Teeth Removal consultation. With an oral examination and x-rays of the mouth, Dr. Kirsch, Dr. Jacobs and Dr. Farag can evaluate the position of the wisdom teeth and predict if there are present or may be future problems. Studies have shown that early evaluation and treatment result in a superior outcome for the patient. Patients are generally first evaluated in the mid-teenage years by their dentist, orthodontist or by an oral and maxillofacial surgeon. All outpatient surgery is performed under appropriate anesthesia to maximize patient comfort. All our doctors have the training, license and experience to provide various types of anesthesia for patients to select the best alternative. 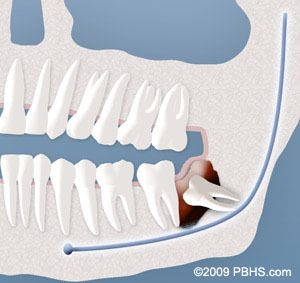 The most common screening radiograph for wisdom teeth is a PANOREX. In some cases a Cone Beam CAT Scan maybe recommended. 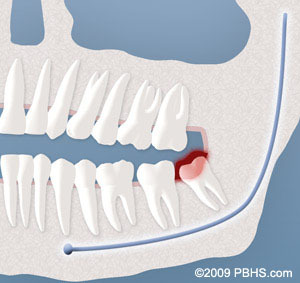 “If the wisdom tooth is deemed to be in close proximity to the mandibular canal, then a CBCT or CAT Scan should be ordered for further evaluation. A single panoramic radiograph could be insufficient owing to image disturbance compared with a CAT Scan. However, CBCT is the gold standard owing to lower radiation exposure and lower cost compared with CT.” J Oral Maxillofac Surg 73:1672-1685, 2015. For your convenience, Drs. Kirsch, Jacobs and Farag can obtain these images right in their office. In most cases, the removal of impacted wisdom teeth is performed in our office under IV sedation or general anesthesia. Anesthesia options, as well as your specific surgical risks (i.e., sensory nerve damage, sinus complications), will be discussed with you at your consultation visit before the procedure is performed. Once the teeth are removed, the gum is sutured with dissolving sutures that will melt away as you heal. Immediately after your procedure you will rest comfortably under supervision in the office until you are ready to be taken home. Upon discharge, your postoperative kit will include gauze, ice pack, postoperative instructions, prescriptions medications, and a follow-up appointment. If you have any questions, please do not hesitate to call us at NJ Center for Oral Surgery Phone Number 973-226-8444. Our services are provided in an environment of optimum safety that utilizes modern monitoring equipment and trained staff who are experienced in anesthesia procedures. 5 out of 5 stars based on 1046 Wisdom Teeth reviews. Very happy with the care that I received. Thankful that Dr Jacobs and his staff were able to make time for me during an emergency situation. Very friendly and always felt like I was in great hands. Everyone made the experience easy and comfortable for me. I was happy that all my questions were answered and understood. The wisdom teeth surgery felt very quick and everyone was very friendly even while I was drugged up. Dr. Farag & the team were amazing! Will definitely recommend to family & friends who need their wisdom teeth removed. I had a terrific experience here. Would recommend. Good, confident doctor, made it so I had no anxiety about my procedure. I had a great experience here with Dr.Jacobs surgery was so fast and smooth. He has a great team everyone was helpful and patient while attending to you. I was very nervous and everyone was great. The procedure went very well and I did not feel any pain. I had a friend who got his wisdom teeth out the same week as me at a different orthodontist and he was in a lot of pain and took much longer to recover. I would highly recommend this doctor to my friends and family.